This is a teaser-trailer for Goblin. I co-wrote the screenplay along with Chris Lange; he did the images. Check it out below. Follow the Goblin the Film page on Facebook or visit www.goblinthefilm.com for more updates, darkness, and vlogs about this midwestern horror-noir. Goblin the Film – Promotional Teaser from Christopher Lange on Vimeo. “Sunday Dogs” is a short instrumental. I should have probably added barking dogs to it, but I decided not to make it an intense affair and more of a moment before the barking begins affair. This is a short ambient piece of music. 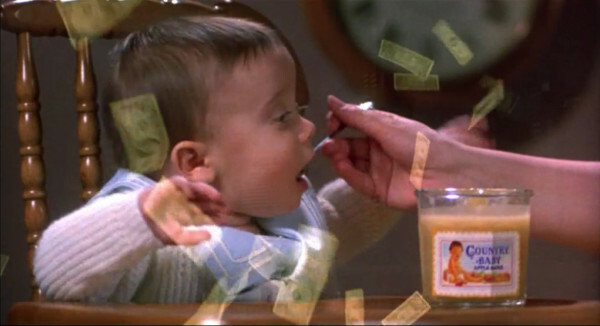 Baby money montage – it’s another James Spader Podcast, and this time we’re reeling in Baby Boom (1987) and possibly a MacArthur Grant. We might even accidentally play a promo for The Blacklist from Youtube as we stream trailers. For now though, get your deck of cards ready and prepare to rate Baby Boom. Screen grabs from Baby Boom. from the 1987 film Baby Boom.